The practical limit to tracking a smartphone-owner’s movements in real time – beneath the resolution of GPS and associated location-tracking technologies – is the sensitivity of the motion sensor. 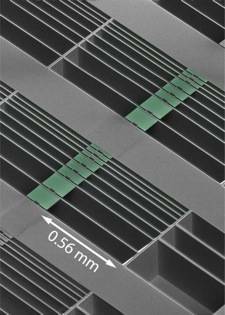 Researchers at Caltech say they’ve taken a step towards very fine motion sensors, using nano-scale waveguides. Today’s smartphones use electrical accelerometers. While these are already small enough for the application, sensitivity is limited, as researcher Oskar Painter explains. “Most sensors are completely limited by thermal noise, or mechanical vibrations—they jiggle around at room temperature, and applied accelerations get lost in that noise,” he explains in Caltech’s announcement. Instead of an electrical accelerometer (a displacement circuit measuring the movement of a “proof mass”), Painter’s group focussed on miniaturising optical accelerometers, which use reflected light beams to measure the proof mass displacement. While already used in high-sensitivity science applications – like the Laser Interferometry Gravitational-Wave Observatory – such detectors are hardly miniature (the LIGO mirrors are separated by kilometres). Down at micro-scale, Painter’s group created a proof mass etched into a chip. These are suspended across optical cavities that are 20 microns long and one micron wide, and a few tenths of a micron thick. Two waveguides (“nanobeams”) in the cavity, one of which is attached to the proof mass, direct a laser and detect how its reflections change with movement of the proof mass. The sensitivity of the detector reaches down to a few femtometers, the researchers say. Even cooler – forgive the pun – because everything in the system is so small, the lasers damp unwanted movement in the proof mass. “In our device, the light applies a force that tends to reduce the thermal motion, cooling the system,” Painter said – down to a temperature of three Kelvins (about –270°C) in the current devices. That gives the detector the flexibility to sense both very large and very small accelerations, making it suitable for oil and gas exploration, bio-medical sensors, and aircraft applications. Oh, and yes: if commercialised, a nano-scale optical accelerometer would be sensitive enough to map a shopper’s movements within a supermarket, allowing them to be bombarded with aisle-specific advertisements.